HP Consulting Services have been developing the design of their flexural diaphragm for a number of years. Over this time they have adapted the design to include multiple stages and removable jaws. These unique changes to the design have attracted the attention of many worldwide corporations. 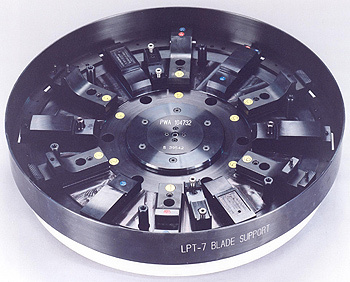 Companies such as United Airlines have used the diaphragms to significantly improve the accuracy and time taken to balance multiple stages on their engines for overhaul. Deflecting the centre of a flexural diaphragm moves the centre of the diaphragm up or down. Depending on the direction of the deflection the engine part to be balanced is gripped on its internal or external surface by the jaws of the diaphragm. When the deflected diaphragm is released it causes the force to be transferred to the engine part. This transfer means that the engine part becomes gripped and as a result can then be balanced. 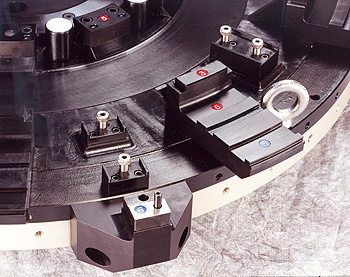 Our flexural diaphragms are highly accurate and boast a repeatability level down to 0.000030". Customers find the reduction in process time very advantageous. What is a flexural diaphragm? A flexural diaphragm is a circular spring steel plate deflected upward or downward in the centre. After the deflection, an engine part can be placed in the jaws. The plate can then be released. The force of the spring is then transferred to the engine part therefore clamping it.